Letter from Anthony Parkes to LP RE: encloses his application forms for the Arthur Amos Noyes Fellowship in Chem. [Letter from LP to Mr. Parkes November 18, 1952] [Filed under LP Correspondence: Box #313, Folder #1]. 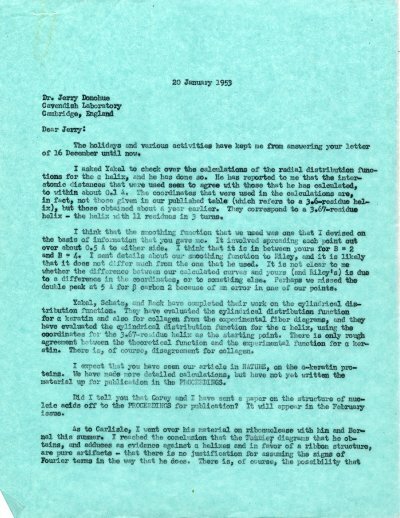 Letter from LP to Dr. A. Young RE: in response to Dr. Young's letter, LP goes on to discuss higher education and systems of propositions in doctorate examinations as well as methods used to improve critical habits of thought in students. [Letter from Dr. Young to LP January 6, 1953, letter of response from Dr. Young to LP February 9, 1953] [Filed under LP Correspondence: Box #462, Folder #9]. Letter from LP to Dr. S. G. Smith of the British Cotton Industry Research Association RE: writes that he will send reprints of their next paper on alpha-keratin proteins as soon as they come out. Looks forward to hearing about their new information on the structure of silk fibroin. [Letter from Dr. Smith to LP January 14, 1953] [Filed under LP Correspondence: Box #379, Folder #1]. The holidays and various activities have kept me from answering your letter of 16 December until now. I asked Yakel to check over the calculations of the radial distribution functions for the a helix, and he has done so. He has reported to me that the inter-atomic distances that were used seem to agree with those that he has calculated, to within about 0.1 A. The coordinates that were used in the calculations are, in fact, not those given in our published table (which refers to a 3.6—residue helix), but those obtained about a year earlier. They correspond to a 3.67—residue helix - the helix with 11 residues in 3 turns. I think that the smoothing function that we used was one that I devised on the basis of information that you gave me. It involved spreading each point out over about 0.5 A to either side. I think that it is in between yours for B = 2 and B = 4. I sent details about our smoothing function to Riley, and it is likely that it does not differ much from the one that he used. It is not clear to me whether the difference between our calculated curves and yours (and Riley's) is due to a difference in the coordinates, or to something else. Perhaps we missed the double peak at 5 A for β carbon 2 because of an error in one of our points. Yakel, Schatz, and Rack have completed their work on the cylindrical distribution function. They have evaluated the cylindrical distribution function for a keratin and also for collagen from the experimental fiber diagrams, and they have evaluated the cylindrical distribution function for the a helix, using the coordinates for the 3.67-residue helix as the starting point. There is only rough agreement between the theoretical function and the experimental function for a keratin. There is of course, disagreement for collagen. I expect that you have seen our article in NATURE, on the a-keratin proteins. We have made more detailed calculations, but have not yet written the material up for publication in the PROCEEDINGS. Did I tell you that Corey and I have sent a paper on the structure of nucleic acids off to the PROCEEDINGS for publication? It will appear In the February issue. I misunderstood the argument that he presented, but I do not think that I did. I hope to see you in Cambridge about 6 April - I plan to stop off for the weekend while on the way to Brussels. Letter from Robert D. Vold to LP RE: thanks LP for his letter of January 8, 1953 in which he mentioned that Dr. Donohue might be interested in accepting a position in their dept. at USC. Says they are interested in both x-ray diffraction and high polymers. Would appreciate further suggestions from LP as to who to consider hiring. [Letter of response from LP to Prof. Robert D. Vold January 27, 1953] [Filed under LP Correspondence: Box #427, Folder #13]. Professor Linus Pauling, For. Mem. R.S. , Gates and Crellin Laboratories of Chemistry, California Institute of Technology, Pasadena 4, Calif., U.S.A. The Editors of NATURE present their compliments to Professor Linus Pauling, and beg to acknowledge the receipt of his letter of January 2 with the communication entitled THE STRUCTURE OF THE NUCLEIC ACIDS by Professor Pauling and Professor Robert B. Corey. The Editors note that the complete paper to which this refers is being published in the February issue of the Proceedings of the National Academy of Sciences. This creates a somewhat unusual position, but in view of the commendable shortness of the communication, the Editors are sending it to the printers immediately and they will arrange to publish it during February.